The product only contains plant cover, the iron stand and flowerpot are not included, please confirm the size of your iron stand before purchasing. Product material: high-quality PVC, corrosion-resistant, durable and sturdy. 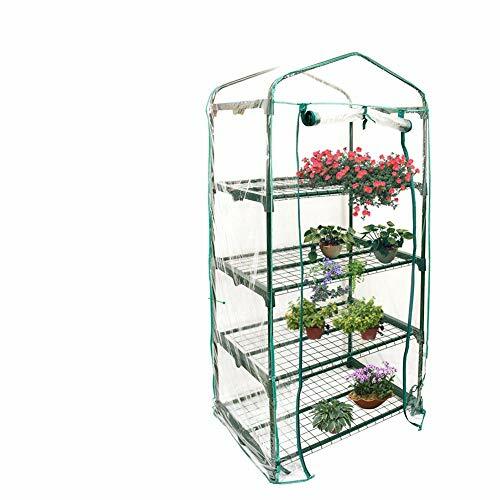 The garden greenhouse can keep warm and protect your plants from the cold and snowstorm to provide more comfortable space for your plant nursery. Roll-Up zipper door gives you easy access to inside the greenhouse. The product is 100% waterproof and anti-UV to enable your plant and flowers to absorb more sunshine provide enough room for theirs growth. It can be used directly supported with a stick or with the iron stand (Actual items do not include Iron Stand and Flowerpot).